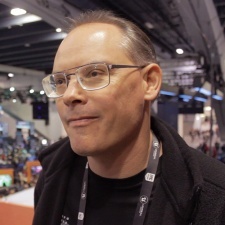 Whenever we sit down with Epic Games boss Tim Sweeney, there's always a lot to talk about - especially at a venue like GDC. We could have chatted about the changes it has made to the Unreal Engine, or the $100m MegaGrants it announced at the San Francisco trade show. Perhaps we could have asked the top bod about the continued success of battle royale title Fortnite. Maybe we could see how Sweeney's collection of fancy fast cars has grown since that game took Epic to the mega leagues. But the Epic Games Store is without a doubt the biggest thing the company has done in the last year. Announced at the end of 2018, this platform has shaken up the PC games retail space with more aggressive revenue sharing and a younger audience that doesn't have Steam accounts. 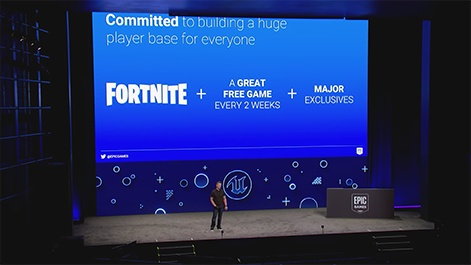 But it isn't just the 250m-plus strong battle royale audience coming to the platform - the regular free games that Epic rolls out on its platform every, er, fortnight have also proven a huge draw. So far, 85m players have downloaded the launcher - though Sweeney refuses to tell us what portion of that audience has actually spent money or downloaded one of the free games. "[The launch] has gone beyond our wildest dreams," Sweeney tells PCGamesInsider.biz. "Our plan was to find the Fortnite audience, with new players coming from us releasing a free game every two weeks plus some really great exclusives like Metro Exodus. The free games have brought in a huge number of players - much more than we expected. It's a great model. Most companies attract customers by running ads, paying Google and Facebook a lot of money. Instead, we pay developers for the right to release their game for a limited period of time for free. They get money, they build awareness of their game, they reach customers who wouldn't otherwise have played it and gamers get free gamers. Doing that, we bring in more people, more economically than advertising. That's a wonderful thing for everyone involved." On-stage at GDC, Epic's plan for growing its brand new storefront. It also made for a good headline, thanks! There's been a mix of good and bad news when it comes to the store. While Epic boasts that its free games have seen a strong performance - both Subnautica and Slime Rancher have been downloaded over 4.5m times each - the firm has come under fire for the rather aggressive way that it has pursued exclusive titles. So far, this has included nabbing projects that have already been up for pre-order on other platforms, as happened with Metro Exodus from Deep Silver. "Well, the timing is unfortunate [with Metro Exodus], but the developer concluded that it would be significantly better off coming to the Epic Games Store," Sweeney said. "What you had was the result of two companies reaching the conclusion that they should work together in this way. Part of that was absolutely honouring the commitments they made to their users who had already purchased the game. We have to realise that outside of the parts of the industry that gamers see, there is a whole economy powering the industry and it's been somewhat broken for a while in the way that stores work and the way that games are funded. "For most games, often the store makes more profit than the developers. That's what we're out to change. In the process we're doing everything we feel is necessary to succeed with that. We're seeing it work. And we're seeing time and time again with Metro Exodus and other game releases that it's the game that succeeds on their merits and it's not the store that makes the game successful. There may be a criticism of the store or exclusives, but the vocal and passionate community there isn't affecting the wide-scale success of these games at all." For most games, often the store makes more profit than the developers. That's what we're out to change. 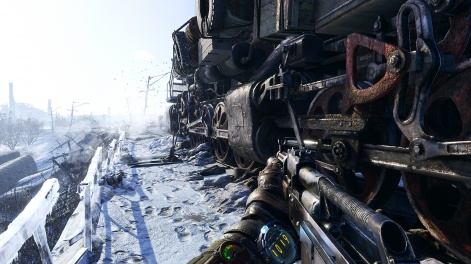 During the GDC keynote, Sweeney discussed Metro Exodus' performance saying that it had sold 2.5 as many copies on the Epic Games Store in the first few weeks of launch as its predecessor Metro Last Light had on Steam - which, head of store Steve Allison said at the show, "was already a very successful game on PC in its own right." "There are a lot of reasons [why it's sold better on the Epic Store]," Sweeney says. "It's a great game, it's a better game than the previous one. It has a better-known audience - the audience knows it better than the previous game. Every reason I've cited there is a reason about the game itself." Despite the storefront dominating any conversation about Epic right now, Sweeney says the biggest lesson he has taken away from working on the Epic Store at the moment is that the games themselves are the real rockstars. "It's about the games," he insists. "There are a lot of stores, everyone thinks the stores have so much power but nope. Metro players love Metro and came to the Epic Game Store and created new accounts to get it. Players wanting any game will go where that game is. The stores are just providing a service to gamers and to developers - they're not the focus." Still, the rather aggressive way that Epic has locked up exclusive content appears somewhat at odds to Sweeney's own vocally held ideals about open platforms. Back at GDC 2016, the Epic boss took Microsoft to task over its brand new Universal Windows Platform ecosystem, which showed promise but was essentially a walled garden. And at Mobile World Congress this year, he was on-stage praising the Big M for its open platform approach to the HoloLens AR system. Locking up content so that it can only be purchased in one place and also saying that all platforms should be open seem like two sets of beliefs that are at odds with each other. But Sweeney doesn't see it this way. "The one idea is different to the other idea," he says. "The fact that a platform should be open to all stores and developers reaching customers directly is a matter of developer freedom and consumer choice. Platforms that are locked down like iOS that only allow a single store is blocking every other store from existing. They are preventing from installing software of their choice. A lot of stores competing is a healthy thing. It means that there is now opportunities to buy games, more sources of funding for games. It's about competition on the one hand and the blocking of competition on the other hand. If you look at the history of content, it's the history of finding ways to fund innovative new projects through business model evolution. Netflix and Amazon have really greatly improved the amount of video content available as a result of their funding of new stuff and their introduction of new stores based on their new stuff. If the principle had been that everything should be available everywhere then they would be just suppliers to HBO or whatever the old cable networks are. We don't want to live in that kind of world." Right now the hot topic in games distribution is - once again - the Netflix or Spotify model; consumers being able to pay a regular fee to access to entire platform of content. Xbox is already doing this with Game Pass, while myriad smaller companies are giving the business model a crack. That's on top of cloud streaming platforms like Google's Stadia - announced at GDC - Microsoft's xCloud and EA's Project Atlas. Sweeney is optimistic about this shift in the sector and what it potentially means for game developers. "It means more opportunities for game developers to get funding, more opportunities for folks to get games in new and interesting ways and more experimentation," he says. "What we see in the state of the games industry today is a lot of experimentation with new business models. There's the new Epic Games Store, there's Google announcing a cloud streaming service, there's Microsoft Game Pass. These are really interesting efforts which are each making major investments and creating opportunities for fo developers. And over time, some will work, some won't, we can't predict that now. But we'll learn along the way." But is Epic interested in launching its own all-you-can eat service. Perhaps Epic Games Gold? Epic Games Prime? The Epic Games Pass? "Well, gee, I guess we're doing that except our subscription is free, right?" he says. "Just come back every two weeks and there's a new game. And there's Fortnite there's this Battle Pass structure. These are things that are working. We'll continue to think about all the possibilities."